Proprietary Name: Extra Strength And Muscle Relief 900 Mg What is the Proprietary Name? Non-Proprietary Name: Menthol And Lidocaine What is the Non-Proprietary Name? 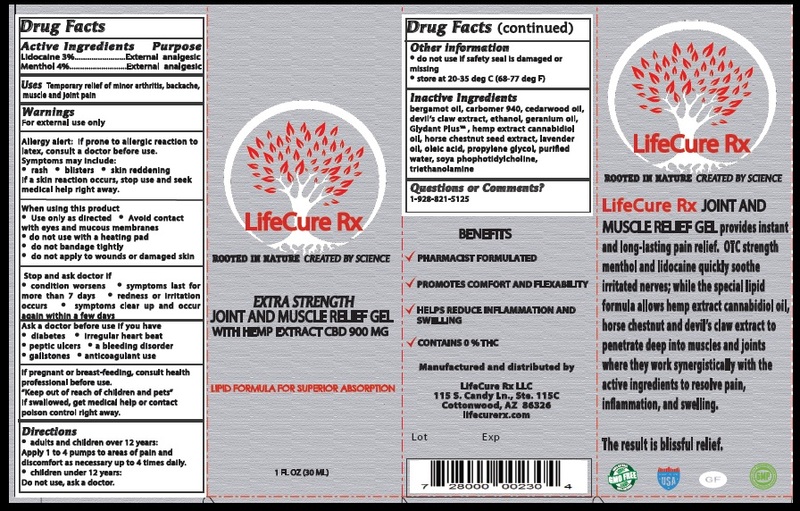 Extra Strength And Muscle Relief 900 Mg with NDC 72800-002 is a a human over the counter drug product labeled by Lifecure Rx Specialty Pharmacy. The generic name of Extra Strength And Muscle Relief 900 Mg is menthol and lidocaine. The product's dosage form is gel and is administered via topical form. For external use onlyAllergy alert: If prone to allergic reaction to latex, consult a doctor before use. Symptoms may include: • rash • blisters • skin reddeningIf a skin reaction occurs, stop use and seek medical help right away. • Store at 20-35 deg C (68-77deg F). Bergamot oil, carbomer 940, caderwood oil, devil' claw extract, ethanol, geranium oil, Glydant Plus, hemp extract cannabidiol oil, horse chestnut seed extract, lavender oil, oleic acid, propylene glycol, purified water, soya photidylcholine, triethanolamine.